Flow cytometric staining of nectin-2 transfected CHO cells using Mouse anti Human CD112 (nectin-2) antibody, clone R2-525 (MCA1937). 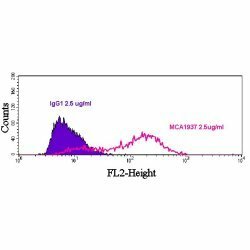 Mouse anti Human CD112 antibody, clone R2-525 recognizes CD112, also known as Poliovirus Receptor Related 2, PRR2 or Nectin-2, a surface molecule originally reported to be homologous to CD155, the poliovirus receptor (Lopez et al. 1998). PRR2 expression is restricted to the myelo-monocytic and megakaryocytic lineages. PRR2 expression has also been detected on haematopoeitic progenitors expressing CD34. Lopez, M. et al. (1998) The human poliovirus receptor related 2 protein is a new hematopoietic/endothelial homophilic adhesion molecule. Goyert, S.M. (1998) White cell differentiation antigens, Myeloid Antigens: section report. Cocchi F, et al. (2000) Cell-to-cell spread of wild-type herpes simplex virus type 1, but not of syncytial strains, is mediated by the immunoglobulin-like receptors that mediate virion entry, nectin1 (PRR1/HveC/HIgR) and nectin2 (PRR2/HveB). J Virol. 74 (8): 3909-17. Verheyden, S. et al. (2009) Role of the inhibitory KIR ligand HLA-Bw4 and HLA-C expression levels in the recognition of leukemic cells by Natural Killer cells. Cancer Immunol Immunother. 58 (6): 855-65. Fionda, C. et al. (2009) Heat shock protein-90 inhibitors increase MHC class I-related chain A and B ligand expression on multiple myeloma cells and their ability to trigger NK cell degranulation. J Immunol. 183 (7): 4385-94.